Home / boxing / Chris Algieri / Floyd Mayweather Jr. / Manny Pacquiao / Sports / Television / Pacquiao Retained His Coveted Title, Mayweather, Jr.— Still Scared? Pacquiao Retained His Coveted Title, Mayweather, Jr.— Still Scared? The pressure just heightened for the boxing superstar Floyd Mayweather Jr. as “Pambansang Kamao" Manny Pacquiao, his long-anticipating and hopeful contender was able to retain his WBO welterweight title against Chris Algieri in a unanimous decision yesterday, November 23, 2014 (Manila time). The highly-anticipated match took place in Venetian Macao’s Cotai Arena in Macau. Algieri down, Mayweather, Jr. still chickening out? Algieri 30, is almost four inches taller than Manny Pacquiao, and is five years younger. He is known for his high volume punches, great footwork, and lateral body movement. Although experience-wise, Pacquiao is already a veteran of 63 fights compared to Chris Algieri who has just 20. Pacquiao was able to score six knockdowns during the 12-round match. It was on the second round when a punch forced Algieri to slip, then fell on the 6th round later, before he suffered on his third tumble following a right hook. After which, three more knockdowns followed, with Pacquiao's famous left-hand punch in the ninth, forcing Chris Algieri to fall on his back again. In round 10, the younger fighter tottered bravely until the final bell. The fight left the New York boxer his first recorded defeat. Now that Manny Pacquiao still has the eight-weight world championship tucked neatly in his belt, will Mayweather change his mind and finally meet his insistent contender? Pacquaio is very vocal in reiterating his hope of facing Mayweather, Jr. which will definitely be the biggest and most sensational fight of their careers if ever it will push through. In the boxing world, the two are considered to be the best fighters of their generation but have never fought against each other yet. If you recall, Mayweather finally admitted his fear of facing the great Filipino boxer last October for reasons of losing his undefeated status, most especially that he is already on his verge of retirement from the ring in a few more years. He stated, however, that he is not closing the door yet on a possible match-up with the Filipino boxer. He was quoted that he will decide in the next few months. Well, with the recently concluded victory, is he not as well hungry of glory? The heat is on and all eyes are on you now Floyd Mayweather Jr. The boxing fans of both camps worldwide will definitely celebrate once he will overcome his worst fear and will finally agree for a Mayweather vs. Pacquiao match. 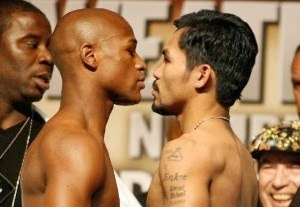 It certainly will be the biggest fight in history! hopefully this two will fight?